I've really missed having a green man since I sold the last one in April. 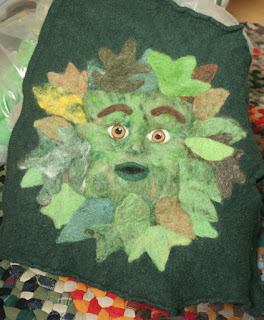 After he went home with the musicians in Glastonbury, I started felting leaves and keeping them in a basket. The boy helped with mixing the colors for them. Finally on Saturday I couldn't wait any longer and started in on him. I pulled a green sweater front out of the bin (for the backing), and built the face out of MaryAlice's white wool with my hand-dyed greens on top. It's a bit puffy still, but will shape up more the more I needle it. It may look like there's not much more to do, but it will take a lot more needling to firm things up, give the leaves more definition, and give the man a beard and mustache. Then I'll cut him out of the sweater and add a hanger. This is the kind of thing that's hard to put down when I get started on it, yet I have to, so I can have perspective on it as well as rest my arm! Hello, your Green Man is wonderful. Im sure he was fun to make. The colours are beautiful put together. Nice work ! Thanks! He has been fun. I'm in the grunt work of fine details on him now. I'll post again in a few days with a new picture.